In hands-on testing, PT found that the Dell OptiPlex 7050 Micro upgraded with Intel Optane memory had faster restart, application launch, and file copy times compared to the same system without Intel Optane memory. Durham, NC, February 01, 2018 --(PR.com)-- Responsive systems that allow you to complete everyday tasks more quickly can give you more time to work and play, and upgrading certain components from a base configuration can improve responsiveness. Principled Technologies (PT) compared the performance of a Dell OptiPlex 7050 Micro desktop configured two ways: 1) with a hard disk alone and 2) with a hard disk accelerated with Intel Optane memory. 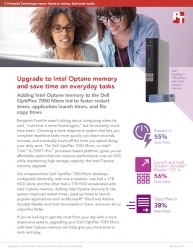 To learn more about how users can benefit from accelerating their Dell OptiPlex 7050 Micro desktops with Intel Optane memory, read the full report at http://facts.pt/2QxauW and see the infographic at http://facts.pt/G4wefH.